If you want to go into business during tough economic times, you might want to do it with family. At Sokol Blosser winery in Dayton, Oregon, siblings Alex and Alison Sokol Blosser took over as co-presidents of their parents’ business just as the economy went downhill in 2008. They had been selling most of their high-end wine in restaurants but when the recession hit, people stopped eating out as much. So they had to shift a lot of their business to retail, which took a lot of time and effort. Revenue and profitability took a hit. “We had to spend a lot more money in marketing and sales, so we just poured money into that so profitability was what really got squeezed,” said Alex Sokol Blosser. What kept them going is that the siblings see themselves as stewards, rather than owners, of the business that their parents started in the 1970s and that now produces Pinot Noirs, Pinot Gris and blended wines. “We’re looking to make it a better business,” said Alex Sokol Blosser. They have short-term goals that they want to meet, but they are looking at the business as one they want to pass on to their own children, if they’re interested. Some family businesses are more resilient during downturns because of that focus on the long term as well as a commitment to their customers, and employees and careful spending, said Pramodita Sharma, a University of Vermont business school professor, and editor of the Family Business Review, a scholarly business journal. “What differentiates family from non-family enterprises is the significant influence of family in business and focus on the long term. They work not only for the current generation of the family but also the future,” Sharma said. According to the Family Business Institute, 90 percent of U.S. businesses are family-owned. Some giants got their start as family businesses including retailer Wal-Mart and automaker Ford. 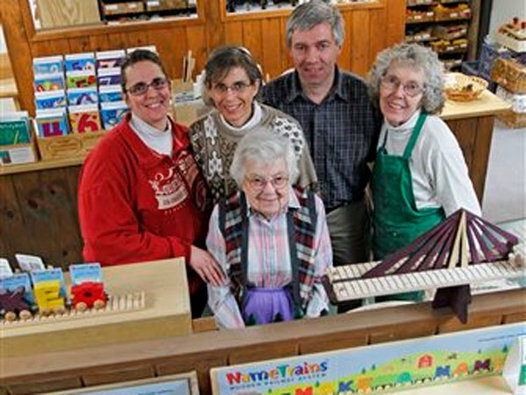 Maple Landmark, a wooden toy company in Vermont started by Michael Rainville, now employs his sister, his wife, his mother and his 93-year-old grandmother, as well as his sons when they’re not in school. Rainville, whose business grew out of a hobby he had as a kid making game boards from scrap wood, is willing to work extremely long hours and do whatever it takes to keep the business going. “I don’t have grand expectations. I don’t have a Volvo payment before I pay my payroll. This is what we do. It’s my sandbox, I enjoy it, I don’t want to see it go away,” he said of the company that last year won an award from the University of Vermont School of Business Administration for its long-lasting success. Competition from imports is a constant struggle for the company, which makes wooden trains, jigsaw puzzles, blocks, and cribbage and checkers boards. When business softened after 2001, they bought a similar Vermont company so they could offer a broader array of toys. But between 2002 and 2007 they were lucky if they grew at all each year and ended up smaller at the end of the period by about 15 percent. Rainville said he didn’t have any more tricks to pull out his bag so they focused on being more efficient. “We’re pretty frugal Yankees but you find ways to be sure that you’re not spending more than you need to. You just shop for things harder, you watch your expenses more,” he said. Working with family is ingrained in Rainville. The family helped out with his grandparents’ dairy farm and, as a teenager, he pumped gas after school and on weekends at his parents’ general store. But Alex Sokol Blosser, never dreamed he’d end up working for the family’s vineyard, started by his parents who planted the first vineyard on the land about 30 miles southwest of Portland, Oregon, in 1971. Now the 87-acre estate in the Dundee Hills produces Pinot Noirs ranging from about $40 to $80, as well as an $15 Evolution Red, and a line of white wines. He worked in neighboring vineyards and with a Portland wine wholesaler before joining the family business full time in 1998 while earning an MBA degree. His younger sister also earned an MBA and went on to work in public relations before returning to the family business in 2004 as director of marketing. Today, Alex oversees production as winemaker and grape grower. Alison handles sales and marketing. But the familiarity of family can also have drawbacks. Any drama or tension among siblings or parents needs to be checked at the door, which is something they learned from a business coach and from family business counseling from the Austin Family Business Program at Oregon State University. “Without our business coach and family business counseling we couldn’t have made the transition” from one generation to the next, he said. Like the Sokol Blossers, brothers Charles and Arthur Anton also grew up in the family business, Anton Cleaners, based in Tewksbury, Mass. Their grandfather started the business nearly 100 years ago. When the economy soured, people were dry-cleaning their clothes less often, he said. But like the Rainvilles and Sokol Blossers they didn’t resort to laying off employees. They cut back hours. They strategize constantly about where they want to be and their five-year plan, said Arthur Anton, Jr., chief operating officer.